Crown and Bridge restorations are one of the main treatment methods used by general practitioners to achieve lifelike restoration of form and function. Mechanical durability and precision fit are mandatory requirements for crowns and bridges. The development of various casting alloys and precise casting systems has contributed to the successful use of metal-based restorations. However, patient requests for more aesthetic and biologically 'safe' materials has led to an increased demand for metal-free restorations. There is also a growing demand to provide all-ceramic restorations more routinely. New materials such as highly sintered glass, polycrystalline alumina, zirconia based materials and adhesive monomers, will assist dentists to meet this demand. In addition, new fabrication systems combined with computer-assisted fabrication systems (Dental CAD / CAM) and various networks are now available. This means a top quality crown which will last for many years. 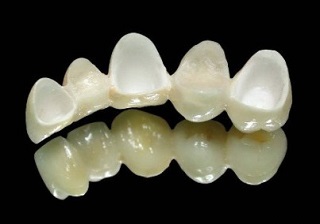 The majority of all ceramic crowns are produced using computer technology, eg. CAD / CAM technology which is based upon 3D design. These crowns are ideally suited to people who prefer something which has a natural appearance. They are made from a strong material which results in a crown that mimics the natural tooth completely. The material used is 'bio-compatible' which is kind to the gum tissue and enables it to grow back alongside the crown. Perfect fit and design as these are fabricated using the CAD / CAM technology.